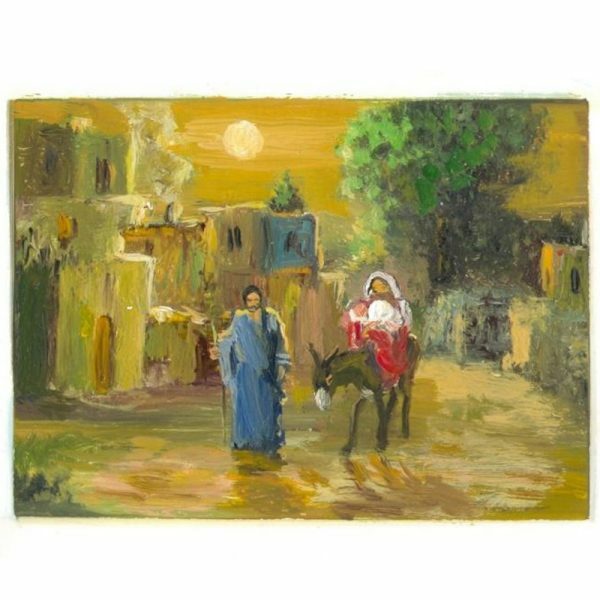 Part of a four-part series of Christmas Cards featuring prints of Zaki Baboun’s paintings. This one portrays the biblical account of the Holy Family’s flight to Egypt. They left as refugee, much like the millions of displaced refugees in the world today. This card was custom printed exclusively for Bethlehem Bible College with the following message inside. Partnering with local craftsmen, artisans, and non-profit organizations. Sharing their stories with other Christians around the world. Giving all our proceeds to provide scholarships at Bethlehem Bible College. © 2019 Bethlehem Bible College Gift Shop - StarBazaar. All rights reserved.